This summer, more summertime workers will be employed at Rani Plast’s Teerijärvi location than ever before. The summertime workers will begin their tasks during April, May and June and they will stay for two to three months. “We want to give young people an opportunity to summer jobs and, at the same time, an opportunity to get to know the industry. For many, the summertime job will be their first contact with working life, thus we also want to make the employment periods as positive as possible. Hopefully they will also be able to utilize what they have learnt in their future studies and working tasks” says CFO of Rani Plast, Tommy Wikman. This year, almost 200 applications were received for positions, of which approximately 50 young people were selected. Rani Plast’s production has grown considerably over the last few years, which means that more films will be produced through the summer. This is why the number of summertime workers has also increased, compared to previous years. 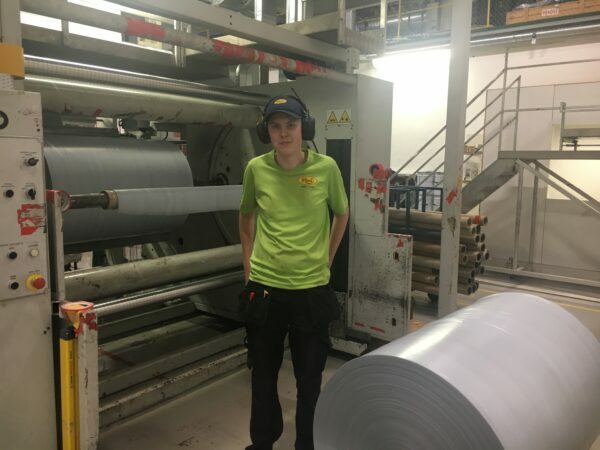 The summertime workers will work mainly in film production, in further processing in the printing and sealing department, as well as in the hectic logistics department. In addition to these working tasks, some also work in maintenance and with administration. “The summertime is an excellent opportunity for students to become acquainted with Rani Plast as a company, whilst we also have a good opportunity to find new workers. It is not uncommon that a summer position results in a permanent employment relationship with Rani Plast”, says Production Director Simon Fagerudd. The summer workers start off their work through an induction program and under the guidelines of an instructor. “Work has commenced well in all departments. At the moment, work has begun through easier tasks, such as packaging, and little by little, more challenging tasks will be introduced”, Fagerudd continues.